Scottie Mom: Don't Call My Scottie Fat! I'm 26 pounds and the only ones who think I'm fat are the ones that look at the scale. Agreed! My Pippen was once a little overweight (she's lost a few lbs now and is a healthier weight) and I took her to one of those clinics for inexpensive vaccinations. The vet tech said to me "You know, dogs get diabetes for the same reason people do". I must have given her such an awful look, because she followed that up with "but you won't get diabetes......" Oh man! I was so mad! We have the exact same situation here: Wallace is about 3 - 4 kilos heavier than Sammy but he is also bigger than Sammy in stature. I know that they are both healthy and get lots of exercise and that is all that matters to me. You don't look fat to me Miss Heather so I'm pleased your Mom fights your corner! Oh Heather, you're lovely just the way you are! I was a little bigger a few months ago, but after my last furcut my peep noticed I'd lost some of my "puppy fat". My uncle Fergus has always been a bigger, then They found out he had cushings, and that he was retaining water. People used to make comments all the time. They didn't know his story either, people shouldn't judge! Oh Miss Heather. You are wonderful the way you are, just like Dougall says. Don't listen to those nasty peeps - what do they know? 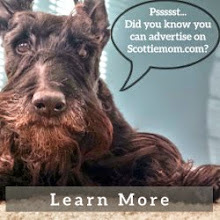 Your Scottie Mom knows best and what a grand job she's doing. RooOooodles. 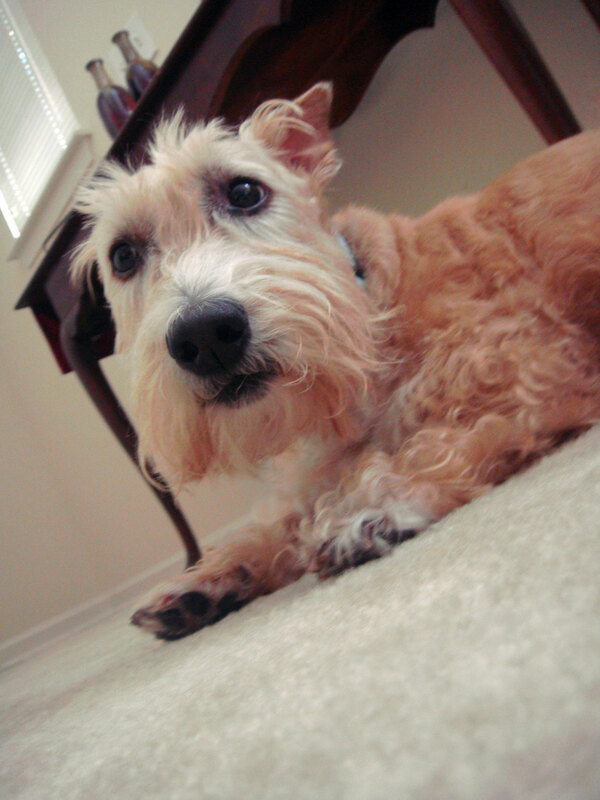 My Scottie (Tessie) weighs 34 lbs...she's happy ,healthy, and full of energy! She's just a big girl. We never intended in breeding her or showing her even though she (IS) gorgeous and has the BEST personality. Our Vet said she's fine...he's even seen bigger Scotties. She's very long. Miss Heather don't you worry...just cause those others are between 17 and 22 lbs...doesn't mean they're perfect like you! She is an unusual colour, very pretty. Maybe the people that are saying she's big don't mean fat. The important thing is that you know she's at a healthy weight for her size. People often say, "that's HUUUGE" about me. I'm only 120 pounds - perfect for my height! Dear Scottie-Mom, Heather is a BEAUTIFUL girl! As long as she is healthy & gets her exercise, that's the priority, right? Sillly people! Our unique-ness, & our dogs, should be cherished. Many kisses to you dear Miss Heather & Mr K-- celebrate your unique beauty, body & soul! Ahhhh- weight prejudices are not any different for our furry kids than they are for humans. Maybe it is even worse because so many people do not know enough about the breeds. When people poke fun at my Scotties' weight I have responded - "Yes- they have really strong chests and are very powerful dogs in a compact package. That's why they are so effective at ratting out vermin." Don't let it both you- both your Scottie kids are BEAUTIFUL!!!! Hi again- I wanted to share some news with ScottieMom, Heather and Mr. K. The bad news is that we lost our little boy, Macalister, last weekend to lymphoma at the ripe old age of 14. Against my better judgment- I let the vet convince me that those swollen lymph nodes may be due to Mac needing a dental. Because the vets schedule was busy, we could not get in for 3 weeks. After about 2 weeks, Mac went from appearing perfectly fine to lethargic and not interested in eating. This lymphoma was VERY aggressive as it often is in dogs- so my advice to you is watch those lymph nodes (you know your dog best) and if there is any doubt, push your vet to do a needle biopsy. An early diagnosis is critical here. At least Mac was not in any obvious pain since it grew so fast. We all feel lost without him but Maggie got to see him in the hospital both before and after- and I believe she understood that he was sick and did not come home with us. She isn't looking for him around the house- but does love sniffing his pillow and curling up in his place. 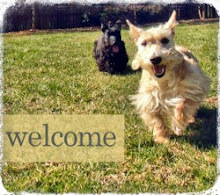 Love to all our Scottie friends from our 'heavenly' Scottie, Mac! @IndyScottieMom - I am so terribly sorry for your loss. How very quickly his condition progressed. That is truly frightening and I cannot imagine the pain your family is going through. I'm glad Maggie got a chance to say good bye and I'm sure she'll rememeber Mac fondly every time she sets a paw on his pillow. Much love to you, Maggie and the rest of your family from Heather, Mr. K and myself during this difficult time. Rest in peace, little Mac.